CyberMedia Research, a leading technology research firm from South Asia, unveiled the India Budget Charter 2019, listing key opportunities, and recommendations for the Union Budget 2019. A populist budget is likely around the corner as the government prepares itself for the upcoming general elections in May 2019. CMR expects the Government’s expenditure growth to slow down and the impact on CapEx will be severe if the farmer support scheme is implemented. Any large social spending schemes without proportionate measures to increase revenues may not help much in accomplishing fiscal consolidation goals. “It is a catch 22 situation for the government as it has political compulsions to appease people with populist sops which may supersede the fiscal consolidation focus that the government had for the last few years and it get more difficult with the huge shortfall in GST collections and divestment target.,” said Thomas George, Senior Vice President and Head-CyberMedia Research & Services Ltd. (CMR). Nevertheless, some populist measures would really help, like some relaxation of income tax rules to give consumers more income at their disposal. 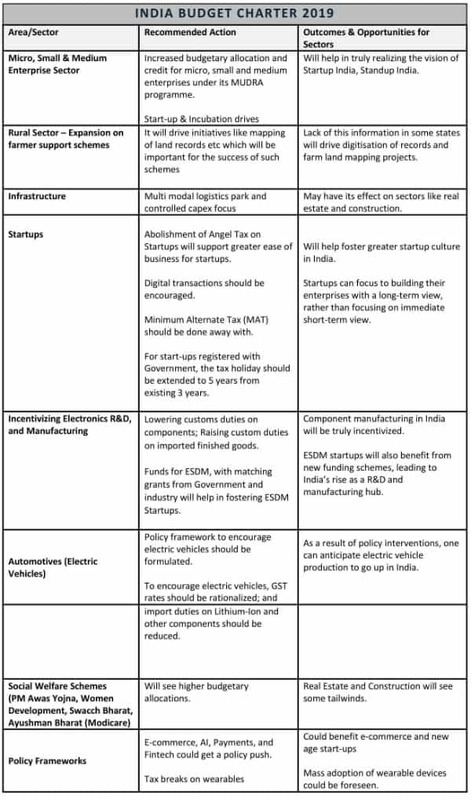 Similarly, some sops for startups to help bolster growth of this eco-system would also help. “Relaxation in income tax rules would lead to more disposable income in hand, which in turn will enhance individual spending. The e-commerce and retails sectors could really benefit from it. Abolishment of the Angel Tax on startups among other things, would really help this eco-system grow,” said Anil Chopra, Vice President, Research & Consulting, CyberMedia Research & Services Ltd. (CMR). From a technology Point-of-view, the Budget should look at providing a policy thrust for emerging technologies, including among others, Artificial Intelligence (AI) and Blockchain. This in turn, would result in new business opportunities across the spectrum, and fostering India’s leadership therein. CMR’s ‘India Budget Charter 2019’ Lists Key Agenda for Union Budget 0 out of 5 based on 0 ratings. 0 user reviews.